PAN India 3G service provider, Bharat Sanchar Nigam Limited (BSNL) is continuously increasing its market share by adding more and more new mobile subscribers to its network. The PSU added more than 2 million new mobile subscribers during the month of July 2016. As per the latest information, the recently launched promotional prepaid mobile plan - Student Special - has already made an impact among youngsters, especially the Student segment. 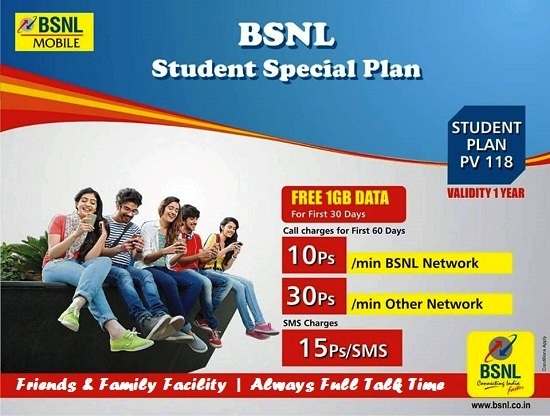 BSNL Student Special plan comes with a bundle of exciting offers which include - 1 GB Free 3G Data + Reduced Call Rate of 10ps/min (to all BSNL numbers), 30ps/min (to other network numbers) + 1 Year validity + 2 Friends & Family Numbers @ 10ps/min + Rs 10 Talk Time + Always Full Talk Time for selected top up denominations etc. The best performers in SIM sales during July 2016were - Punjab, Andhra Pradesh, Jammu & Kashmir, Kolkata, UP (West), Kerala, UP (East), and Andaman & Nicobar and Rajasthan telecom circles. BSNL started showing positive signs of revival form June 2015 on wards, after the launch of Free All India Roaming Scheme for its Prepaid and Postpaid Mobile customers. As per latest TRAI reports, BSNL registered tremendous growth in gross mobile connections per month during February, March, April and May 2016. MNP (Mobile Number Portability) figures are also positive for BSNL since last year. In Kerala Circle, BSNL pushed Vodafone to third position and reclaimed its second position in total wireless subscribers. FREE All India Roaming (Voice & Data) and Lowest 3G Data Tariff are the attractions of BSNL Mobile Services. More and more new customers are being added to BSNL Network from other operators through Mobile Number Portability(MNP). Dear readers, please share your views and opinions about this excellent performance made by BSNL in new subscriber addition via comments with us. Even though student plan is very good BSNL has not advertised it properly. If you put one day add in all newspapers in India and few hoardings on roads BSNL would have achieved at least 5 million customers in a month.